Here are answers to some frequently asked questions about Capital for London. Is there a standard form for investment proposals? Yes. If, following receipt of your brief summary proposal we feel it has potential, we will send you a form outlining the information we require. What is the timescale for proposals to be considered? What happens once I submit a proposal? Proposals are first examined by our staff who will assess what additional information or clarification is required and contact you accordingly. If required, we may also visit you or ask you along to our offices to discuss your proposal further. If the staff feel your proposal to be worth taking forward, it will then be considered by our MRI Committee (who are Trust for London Trustees) that may make a decision straightaway or, more likely, request further information. Organisations seeking larger investments are likely to be asked to complete a more in-depth proposal and possibly to present their proposal in person to the MRI Committee. Yes. However each new proposal must follow the same application process i.e. an initial brief summary and completion of a proposal pro-forma (supplied by us). We have been grant funded by Trust for London, can we still make a proposal for investment to Capital for London? Yes. Trust for London grant funding and Capital for London investments are managed separately. We will of course look at all sources of income an organisation has when considering an investment proposal – just as we do with grant applications. When can I approach Capital for London with an investment idea? You can contact us anytime. We have no fixed dates or deadlines for this type of investment. Initially we ask that you telephone us to discuss your idea informally and, if we feel it has potential, we will send you an investment proposal form to complete. Are there types of investment you prefer or will prioritise? Yes, Capital for London is particularly interested in property-based investment opportunities but we are not limited to this. Will you invest in high-risk investments? Capital for London will consider each application on a case-by-case basis and this may include opportunities that carry significant risk. Higher risk applications will however need to be balanced by larger returns – financial and social. Do you only invest in London-based projects? 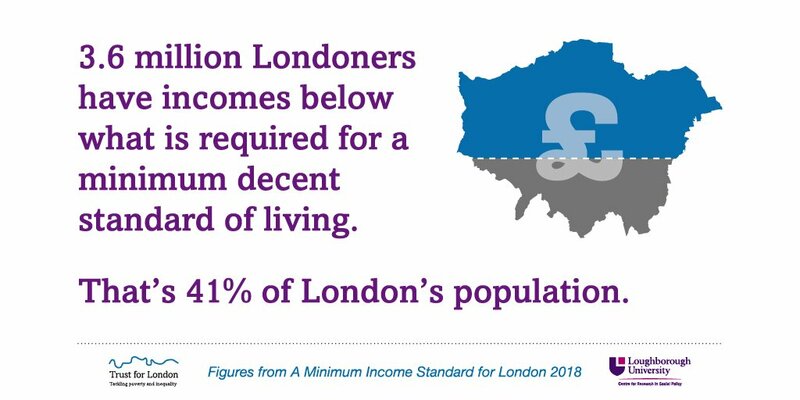 Our mission is to tackle poverty and inequality in London and therefore we will only invest in projects that can demonstrate clear benefit for Londoners. We will consider investment opportunities that work beyond London but they must be able to demonstrate how and what proportion of the work will benefit Londoners. What sort of returns do you expect on any investment? Capital for London aims to achieve long-term financial returns combined with clearly identified social returns. Each investment opportunity will be considered individually and the balance of financial and social returns weighed against identified risks. Investments that yield financial returns equivalent to those currently available in the financial marketplace will be considered to have a good financial return. Social returns will include benefits or opportunities for Londoners that directly tackle poverty and inequality and their causes. Successful applications will be able to clearly demonstrate and quantify the social returns their proposal will create. What size investments can you make? Each investment opportunity will be considered on a case-by-case basis and there is no upper or lower size limit. It is however unlikely that investments less than £100,000 or over £1 million will be made. Social returns are the rewards, opportunities, or improvements in society created through the activities or services undertaken by a project or initiative. Some examples of social returns are: Improved facilities and resources created by an investment to refurbish a community therapy centre. An increase in the number of low cost homes available to disadvantaged groups through investment alongside a housing association in a London based building programme. Increased employment and training opportunities created through providing investment in a community social enterprise. I don’t fully understand what ‘Mission Related Investment’ means; can you explain this more clearly? Although not a new idea, Mission Related Investing involves an organisation (typically an endowed charitable trust) making financial investments in projects with outcomes that meet its mission. However, unlike grants, the investments are expected to generate both a financial and a social return. The size of the financial return will be weighed against social return and a satisfactory balance sought between the two. An example of a large mission related investment is the Resource for London on Holloway Road in Islington. This is a building owned by the Trust for London that we invested in refurbishing to provide to the voluntary sector flexible offices with conference, training and meeting rooms and exhibition space. Whilst the rentals paid by tenants (and the capital gains on the property) provide a fiscal return to the Trust, there is an additional social benefit gained by providing high quality reasonably priced premises to third sector projects.